For over 30 years, BRAVO has been enhancing the existing public school music curriculum by offering interdisciplinary music lessons. Our goal is to help make music an integral, enjoyable, and exciting part of the everyday learning process while providing critical music education opportunities for Ojai Valley students. BRAVO believes that a robust music education is vitally important for all students. Through BRAVO programs, students learn the fundamentals of music making, engage in creative problem solving, develop teamwork skills, and discover how music relates to their other core curriculum, especially language arts, history, geography, and math. The BRAVO program enriches students’ foundational skills for academic and personal success. Local Chumash tribal elder Julie Tumamait shares the history of the Native American population that lived in the Ojai Valley through music, story and movement. Local third grade classes visit with seniors at The Gables Senior Living and the Ojai Community Hospital Continuing Care Center. As the children learn the names of each resident, they ask if they can be their partner. They play Rig-a-Jig with skipping, Kitty Casket with spinning, and Roll Little Liza with finding ways to roll. The children include any seniors that are eager to get up and join, or sometimes just by holding their hand. They sing a Thomas Tallis canon from the 16th century. They ask the residents to share their wisdom. Singing the Love Canon, they look into each other’s faces, and acknowledge the love and care that is in the room. The intergenerational experience brings deepened relationships for all ages. The whole time is just irresistible!”. Education Through Music (ETM) integrates vocal music lessons with critical thinking games to teach the fundamentals of pitch and rhythm. Through weekly music workshops, ETM improves students’ pattern recognition, social skills, and teamwork abilities. ETM is offered to every K-3 student in the Ojai Valley, including selected special-needs classes. The program ensures that young students continue to have access to music education by replacing the once-standard music classes that have since disappeared from public school curricula. 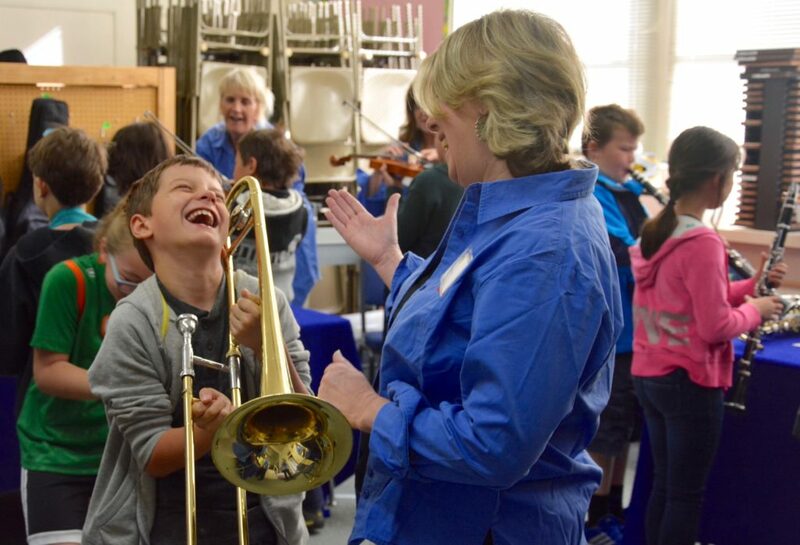 BRAVO’s Music Van brings instruments from all orchestral families to third grade classrooms throughout Ojai and two Ventura schools for hands-on demonstrations and exploration. Staffed by dedicated Festival volunteers and Women’s Committee members, the Music Van is timed to grant students the opportunity to try instruments before signing up for the district band program. Special thanks for Music Van supplier the Santa Barbara Symphony Music Education Center. Every year, the IMAGINE concert introduces young students to peer and professional musicians, and to give musicians of different ages the opportunity to make music together. The Festival’s BRAVO music education program is made possible by many generous donors and welcomes your support. For more information on BRAVO, please contact the Festival office at 805 646 2094 or info@ojaifestival.org. Bravo’s Upbeat program brings joyful music to an additional segment of the Ojai community, at the Continuing Care Center, The Gables Senior Living, and the Arc Ojai Enrichment Center. Storyteller Joann Yabrof brings delightful stories and song to residents. Speech Pathologist Kathy Broesamle sings and moves with clients. Cameron Schubert plays classical and celtic cello, and performs several of his original compositions. Julie Tumamait reaches out to the elders in the spirit of Chumash traditional songs and dances. And Elijah Imlay plays middle eastern and klezmer-inspired clarinet music. These experiences provide the opportunity to take part in collaborative music-making and musical expression. For more information, contact the Festival office at 805 646 2094 or info@ojaifestival.org.